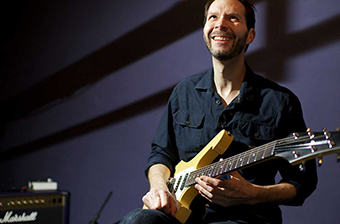 Paul Gilbert has poured a wealth of musical knowledge into hundreds of rock guitar lessons. Students in the electric guitar course have unlimited access to these video lessons, as well as guitar tabs and study materials (like the "Paul Gilbert Book of Guitar"). Solid curriculum, excellent teachers, and an active vibrant community hooked on learning. I love it! Love learning guitar from a true rock legend Paul Gilbert. I have played off and on for about 15 years and since I started following the lesson plan I have gained a better understanding of music theory and improved my technique. I aways look forward to the next lesson, which keeps me motivated. I also love the fact that I can ask questions to help me better understand the material being learned. I have enrolled on the Paul Gilbert Rock School with ArtistWorks. Paul Gilbert is a fantastic player and amazing teacher. His online training has helped me tremendously to improve my lead guitar playing. The ArtistWorks website is very good. The content at Paul Gilbert’s school is fantastic! I mean where else can you get lessons from a legend at a very affordable price? Fantastic site! Thank you. ArtistWorks gives me the opportunity to share the broad experiences of excellent teachers! This is a great solution for musicians on the go. Outstanding customer support provided. Where else can you get personalized lessons from your guitar hero? I highly recommend this service. Fast customer support. Great service with teachers who really know their stuff and on top of their game. Gui is easily accessible. I have become a much more confident and able player in a relatively short time. Artistworks is a wonderful learning tool. It is very inspiring to have a top professional artist share their knowledge with you and give feedback on music that you are working on. Great teachers, fast answer from support team, great students and fair price! Awesome away to learn a big variety of instruments. Totally exceeded my expectations. I have and will continue to enjoy the site. 100% recommend.